4 Kms. From Brahma Temple Towards Khare-Khari Gram Road . onference Hall, Room Service, Library, Parking, Email & Internet, Laundry, Valet Attendance, Doctor on call, Left Luggage room, Safe deposit, Post holding, Credit card-Visa, Master & American express Accepted. Home stay with affordable prices and with more then basic facilities, peaceful and yet in the proximity of the city center. Hotel, Pure Veg. Multi-Cuisine Restaurant, Valet Parking, Banquet Hall, Swimming Pool. 15 x 18 feet, centrally AC, Tea/Coffee Maker, Mini Fridge, Mini Bar, Bath Room Amenities & Toiletries, study table, 29 Inch LCD Color TV, Tel conn.
23 x 10 feet, centrally AC, Tea/Coffee Maker, Mini Fridge, Mini Bar, Bath Room Amenities & Toiletries, study table, 29 Inch LCD Color TV, Tel conn.
25 x 10 feet, centrally AC, Tea/Coffee Maker, Mini Fridge, Mini Bar, Bath Room Amenities & Toiletries, study table, 29 Inch LCD Color TV, Tel conn.
Kurabar Kothi is a traditional haveli mansion enhanced with modern style & luxury. 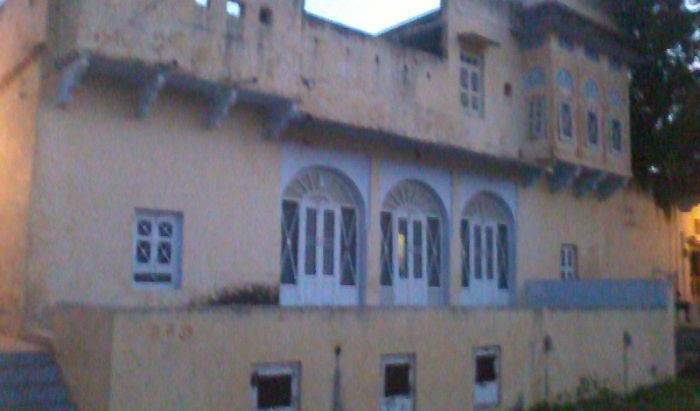 Udaipur best budget with prime location and nice , clean rooms. Awarded for best couple and family hotel. 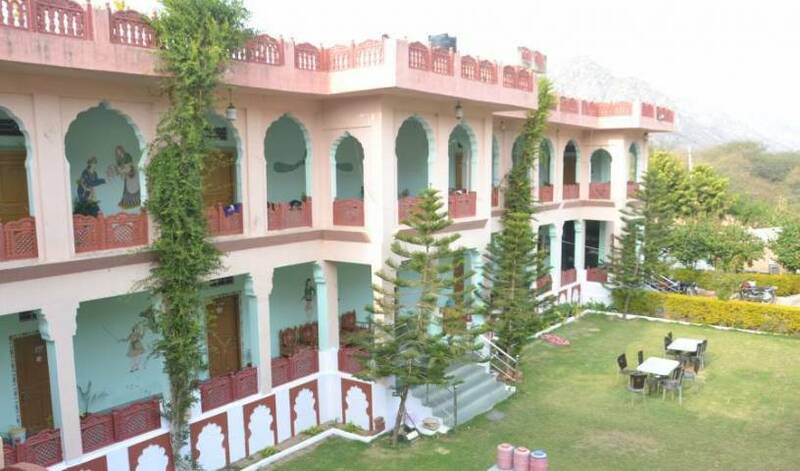 One of the best budget hotels in Udaipur that assures your stay in Udaipur is amazing with all the facilities and amenities. Book your budget hotel today! Rooms with highest comfort level and fulfilling the requirements of executive class by offering them the high quality service at competitive prices. Pleasant and nice room. Avail the fluid empathy of a home with the peace and privacy of a hotel. 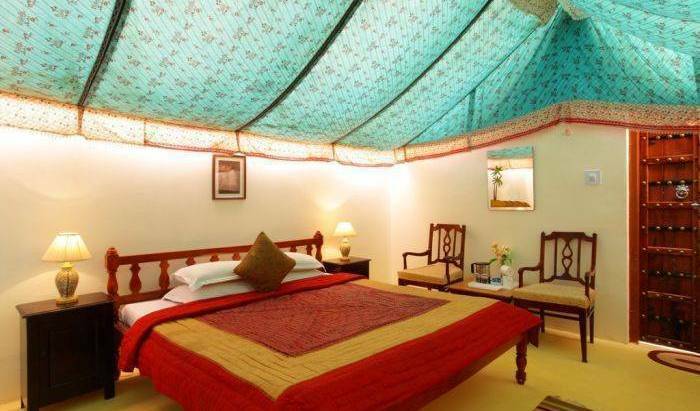 The Ummaid Bagh Resorts, the pioneers of the Tented Accommodation in Hadauti region of Rajasthan, India having 15 A/C tents, is a living farm situated on the banks of the lake Jait Sagar. The Ummaid Bagh Resort where royalty meets nature. The camping site is very peaceful and a perfect place to relax. It is a paradise for bird lovers, combining nature with warmth and luxury. It has lush green lawn, huge trees, surrounded by a hill and lake from three sides with a magnificent view of the lake Jait sagar which is home of many a migratory bird in winter season. 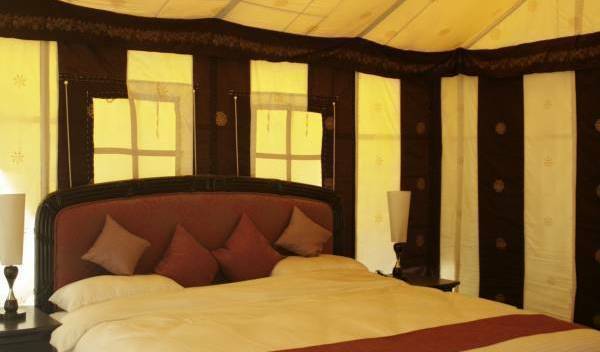 With royal welcome the guests can have a comfortable stay as the camp consists of well furnished air-conditioned tents on constructed base with four feet varandas. 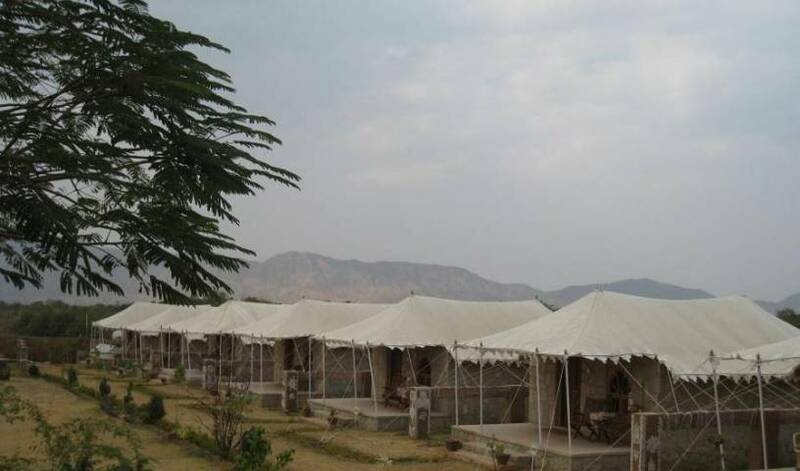 The tents are fixed on circumference of lush green well-maintained garden. The attached bathrooms with western fittings are equipped with hot and cold water. The esteemed guest can take part in many outdoor activities like trekking, jeep safari in adjoining areas, bird watching in the lake, outdoor games, etc. They can make their evening memorable by enjoying camp-fire with Rajasthan folk dance, music in starlit nights. They can enjoy their morning tea with rising sun, birds chirping and overlooking the picturesque lake. 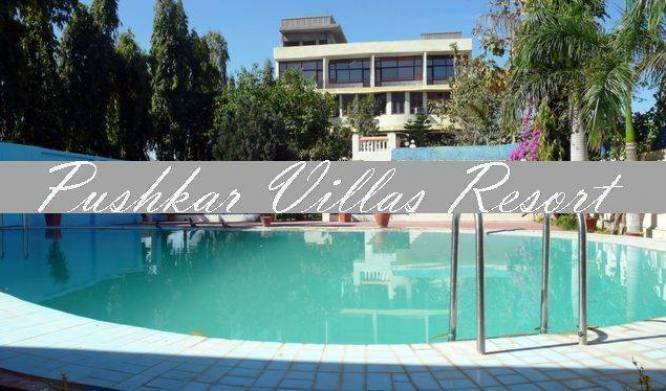 Mohan Vilas is located in Udaipur which is also known as City Of lakes or Venice Of East. It’s a heritage guest house with all modern amenities and facilities along with room services. Air Cooled, Attached Bathrooms with Hot and Cold Water 24 Hours. Large AC room with attached bathroom that has showers. The room open towards a wide corridor. Bedside lamps, telephone, sofa set, writing table and carpets are features of the room. Non Ac Room with a double bed. Perfect for a Single Person or a Couple. free pickup from Railway & Bus Stand. AC Room with a wide double bed. Modern relaxing design, flat screen television with all connections, comfort shower & geezer, modern Amenities , Stylish Furniture prefect for single person or a couple. Free pickup from Railway & Bus Stand. AC Room for a sweet family. Modern relaxing design, flat screen television with all connections, shower & Geezer, Modern amenities. Perfect for Families, Couple or Friends. Free pickup from Railway & Bus Stand. fully furnished a/c room with attached bath having 24 hrs hot and cold running water and all modern amenities. We also have complimentary breakfast and pick up for the guest from railway station or airport within the city. Deluxe Rooms provide a gratifying experience with the approximate size of 10*12. The Deluxe Rooms are suitably furnished to offer optimum comfort to guests. These rooms are ideal for budget-conscious people. Common in-room amenities include satellite TV and telephone. Attached bathrooms are provided with running hot and cold water. The ethnic decor of Royal Deluxe Rooms ensures pleasurable stay of guests. These room category provide a gratifying experience with the approximate size of 12*14. Each room has large comfortable bay windows (Jharokhas) facing the Jaipur Metro, allowing guests to behold the beautiful surroundings. Where one can relax while reading a book or listening to music. King size bed, Ac, tv + tata Sky, mini fridge, kettle tea/coffee, & Ensuite toilet. King size bed, Ac, tv + tata Sky, mini fridge, kettle tea/coffee, dresser, pvt balcony, sofa set & Ensuite toilet. Gangapole, Inside Jorawar Singh Gate. Deluxe Room Each room is tastefully designed to meet the basic comforts and needs of the guest. The interiors are carefully chosen to provide a relaxing atmosphere with the perfect ambiance to relieve the stress of the weary tourist. Super Deluxe Room As the name suggests it provides all the luxury facilities expected of a luxury room. Lavish interiors, state of the art modern facilities to make it an unforgettable experience. Just immerse yourself.. Combination of colors and lights that soothe the tired eyes. An ambience of a palace. So feel like a king. Pamper yourself with the luxury that comes at an affordable price. Your stay here would definitely be a memorable experience. uite Room Hotel Amer View has 4 well-appointed suites. Each suite is spotlessly clean, decorated with Old Heritage style, Belgium and Boono frescoes with traditional furnishings. Every room has a traditional ' Zarokha ' where one can relax with the rays of the sun filtering through the colored glass. All bedrooms are looking out over the old residential houses of the surrounding Aravali Hills and have modern amenities like telephone, CCTV, running hot and cold water, traditional Galicha & air conditioning. A place where you can see the Sun-rise, the Sun-set and full Moon along with the beauty of Aravali Hills. Backpacker panda is the newcomer in backpacking hostel scene to boost the real Incredible India experience. Let's experience India, lets travel around India's beautiful landscape and meet other crazy traveler, backpacker, hiker, camper, biker.